A growing community of contemporary artists and designers has been enthusiastically experimenting with good, old-fashioned manual screen prints. While the newest, super-automated, industrial-grade digital flatbed presses have garnered most of the buzz at the SGIA Expo in recent years, a growing community of contemporary artists and designers has been enthusiastically experimenting with good, old-fashioned manual screen prints. The results of their work can be seen online and live at events such as the Flatstock poster shows at music festivals in Austin, Seattle, Chicago, Barcelona and Hamburg, and the Renegade Craft Fairs in Chicago, Brooklyn, San Francisco, Austin, Los Angeles and London. In the new book "History of Screen Printing," Guido Lengwiler describes how screen printing evolved from an art into an industry. Perhaps future chapters or other books will address the re-emergence of interest in screen printing as an art. The rising interest in the art of screen printing is part of the much broader movement in which independent makers and do-it-yourselfers are crafting small quantities of products by hand, and selling them online through Etsy or face-to-face at festivals. "Interest in buying beautiful, handmade items has grown in the past decade," confirmed Erin Dollar of Renegade Craft Fairs. "Screen printing has always been a popular medium for artists, because it's an affordable production tool that offers opportunities to create multiples without investing in a lot of expensive equipment." She believes the increase in screen-printed products at Renegade Craft Fairs is tied to a resurgence of print arts in general - the same way that letterpress printing has become popular. Mat Daly of Renegade Craft Fairs says interest in screen printing shows no signs of slowing down: "The resurgence of limited-edition gig posters over the past 10 to 15 years has made this diverse and expressive art form more visible. Screen printing is a perfect medium for anything from luscious fine-art editions to graphic apparel to fabric/textile designs to illustrations and stationery items. It's a perfect fit for DIY makers of all types." Today, art schools, community art centers, and co-op studios throughout the US are attracting growing numbers of designers and artists who want to try their hand at making their own posters, T-shirts, art prints and other products. 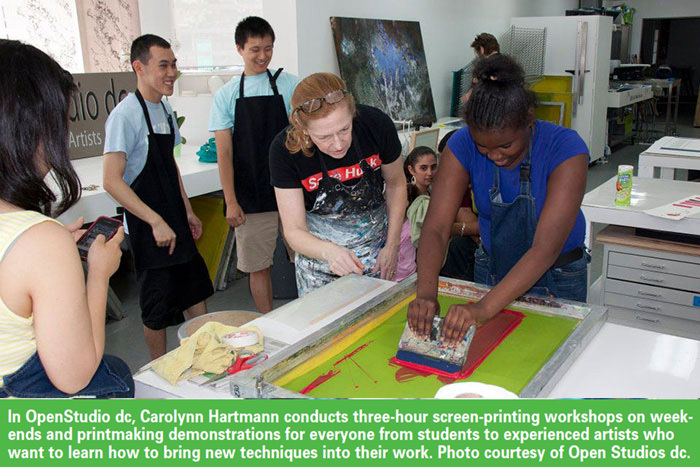 Carolyn Hartmann, who runs the Open Studio dc screen printing studio in Washington, DC says she regularly gets calls from high school teachers who want to bring students on field trips to her studio. Carlos Hernandez, of Burning Bones Press in Houston, says he also hears from high school kids and other young people who want to learn how to screen print, but aren't sure where to start. In many different ways, small business owners are creating greater awareness of the art of screen printing, and making screen-printing workshops and equipment more accessible to more people. In September, two fun-loving screen printers - Aaron Kent and Brandon Hickle - graced the cover of Cincinnati's City Beat arts and entertainment magazine. The image, which showed Brandon about to decorate the side of Aaron's head on a rotary screen printing press, was shot at their DIY Printing business in the Essex Studios building that houses more than 200 artists. The City Beat cover story highlighted shared workspaces for artists, noting that DIY Printing offers a free co-op space for artists who can't afford a four-by-eight vacuum table, washout booth, and other screen printing essentials. During open studio hours Wednesday evenings and Saturday mornings, Cincinnati-area artists are welcome to experiment with screen printing. Many artists are recent graduates of the printmaking program at the Art Academy of Cincinnati who want to continue developing their skills or produce collections of sellable prints. Kent, a graduate of the Art Academy himself, understands how challenging it can be to build a career in fine art: "Our goal is to provide an environment where everyone can create fantastic artwork and have fun while they do it." The co-op approach enables everyone to share ideas and continue to grow as artists. "We believe community is an important catalyst for creativity," said Kent. In January, DIY Printing will host their first artist-in-residence, John Knight, who will work in the studio for about six months. Aaron Kent is also active in the community at-large. He teaches screen printing classes to adults and teens through Art Academy's Community Education program. Last summer, he taught 15 participants of the Starfire University program for people with disabilities how to print their own T-shirts. To help support the studio's operations, Kent and Hickle do commercial, short-run screen printing on T-shirts, bags, and posters for local restaurants, bands and community groups. Most of their work comes from word-of-mouth referrals from companies that like buying handmade products from local businesses. Multidisciplinary artists Pat Jones and Ben Nunery were employed as graphic designers when they founded Powerhouse Factories in 2004 as a small, gig-poster shop. Working with concert promoters and musicians, they have crafted one-of-a-kind, limited-edition posters for venues throughout the US and acts such as Bruce Springsteen, The Black Keys and Wu-Tang Clan. Though they didn't necessarily foresee it at the time, setting up shop in Cincinnati in the long shadow of P&G, KAO and GE would shape Powerhouse's business. Over time, Jones and Nunery parlayed their passion for design and marketing bands into helping big brands. "We have implicitly understood that musicians and bands have a good approach to brand," said Jones. "Musicians' success has always been based on their ability to intersect their image with their music. If their personas and products aren't aligned, people just aren't that interested." Each year, the Powerhouse team travels to music festivals and Flatstock poster shows to sell prints, keep up with new music artists, and reconnect with friends in the gig poster community. After selling prints directly to so many music lovers, Jones and Nunery realized that their insights could help brand marketers create more relevant and engaging experiences for consumers. Today, Powerhouse offers a range of design and branding services while staying true to their roots as a print shop that connects to music, art and culture. To expand their reach in music and art cultures, and to promote handcrafted art and printmaking, they upped their game at Cincinnati's MidPoint Music Festival (MPMF) in September. They came up with ways to show how screen printing can be used to bring music and art together. Powerhouse's presence at MPMF.13 included the "Flooded" gig poster exhibit at the 21c Museum Hotel in Cincinnati, a booth at the Poster Expo, and a Print Lab aboard a box truck. The Print Lab was part of the Box Truck Carnival organized by the ArtWorks' Springboard organization for entrepreneurial artists. Dozens of people climbed aboard the Powerhouse Print Lab truck, tied on an apron, and hand-pulled prints of MidPoint Music Festival posters. In November, Powerhouse designers were part of "Ink Bleeds 4," a popular biennial group exhibition of screen printed posters hosted by the graphic design association AIGA Cincinnati in a gallery at the Art Academy of Cincinnati. "Ink Bleeds is an ongoing celebration of the art of the modern rock poster," said Mark Thomas, co-president of AIGA Cincinnati. "It reflects exactly what our members, students and friends are most passionate about: Creativity, community and, of course, cool." 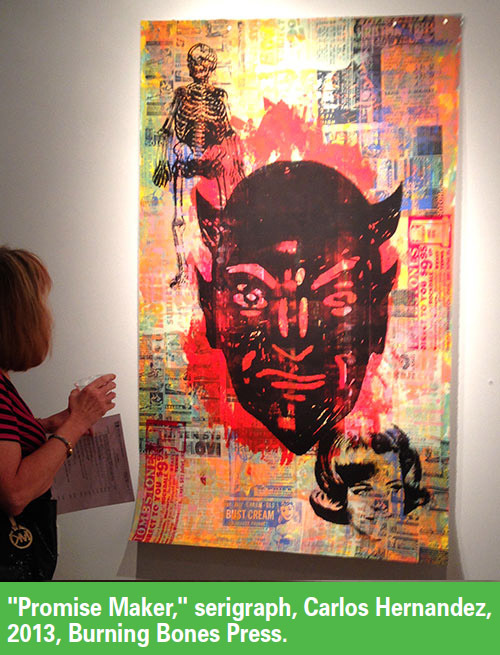 Artists who want to learn how to produce limited editions of original etchings, lithographs, woodcuts, screen prints and monoprints can take classes at Burning Bones Press in Houston. The studio also does contract, collaborative printing for other publishers, dealers, artists and institutions, and offers open-workshop memberships to experienced artists. Two artists founded burning Bones Press: Patrick Masterson and Carlos Hernandez. 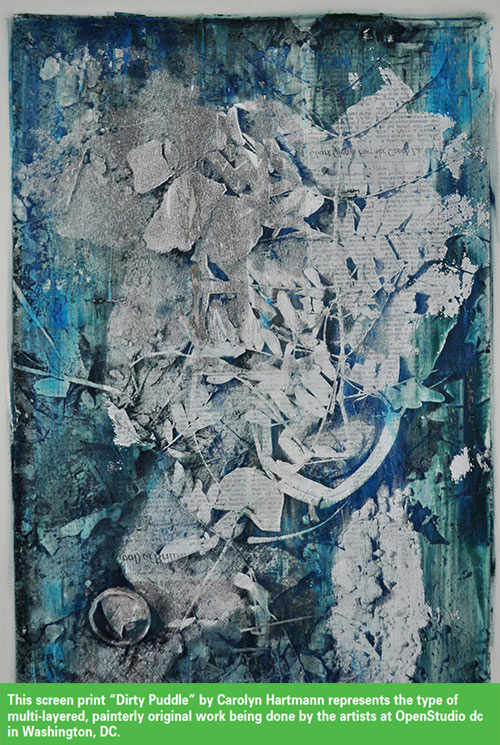 Masterson teaches printmaking at the University of Houston, and is an instructor at The Glassell School of Art. Masterson's work has been collected by the Whitney Museum of Art, the Museum of Modern Art, and the Cleveland Museum of Art. 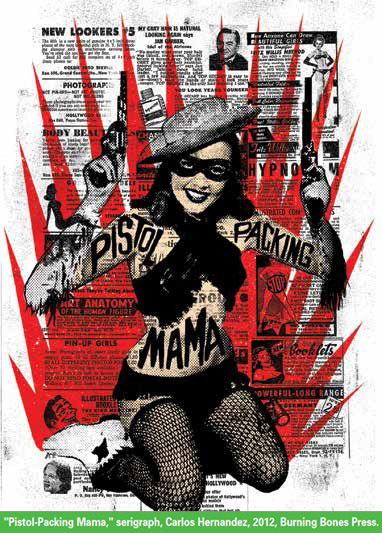 Hernandez, who has a graphic design background, has been featured in the 2011 Communication Arts Typography annual and the 2011 and 2012 Communication Arts Illustration annual. He has designed and printed gig posters for such artists as The Kills, Arcade Fire, Kings of Leon, Santana and the official commemorative poster for the 2013 Austin City Limits Music Festival. Carlos teaches the new screen printing course added to the curriculum of the Department of Visual and Dramatic Arts at Rice University. Hernandez believes interest in screen printing has risen because more people are seeing it on YouTube and at festivals. There is an appealing rawness in the printed posters and camaraderie among the printmakers in the co-op studios. It's a community that many young people want to join. Printmaking also poses a new type of challenge to digitally savvy designers who have learned how to build a website in a night or so. "You can't learn to screen print or do a wood block overnight," said Hernandez. "You have to challenge yourself to learn the medium." Gig posters and other screen printed works sold at festivals are taking printmaking to the masses, says Hernandez. The printmaking isn't locked away in a gallery, but is out in the open where the people are. The Internet has also made it easy for any artist to get global exposure. Hernandez says some of his posters have been purchased online by buyers in France and Japan. Open Studio dc is a screen printing studio for artists in the Washington, DC area. It was founded by Carolyn Hartmann, who became an adjunct professor in the Corcoran College of Art & Design's printmaking department after leaving her career as a lawyer. While the studio does host some designers of gig posters, many of the clients of Open Studio dc are more experienced artists. Some simply want to add a new technique to their work. Others are building second careers in art after spending the first halves of their lives in non-art-related jobs. Reflecting on her own career switch from law to printmaking, Hartmann says 20 years ago she couldn't have imagined that it was possible to make such as dramatic career change: "It was a great journey. I am incredibly happy with it." "About 10 years ago, when I started taking classes at Corcoran College of Art and Design, I sort of stumbled into a class called 'Between Paint and Print'," said Hartmann. "The class taught artists how to use screen printing in a painterly way. I just fell in love with it." After taking a number of classes, she became a teaching assistant, and then an adjunct professor. Now she teaches the "Between Paint and Print" class. In the college printmaking studio, she found it difficult to focus on her own work because students kept asking for help. So when she decided to create her own studio space, she realized she could either put something in her basement, or create a studio that could help other artists. Today, artists can arrange to work at Open Studio dc for a month, a few months or a year - as long as they need to complete a specific project. Carolyn also offers three-hour workshops on weekends, because she understands that people of all ages need an outlet for creative expression (and relief from the stress of the modern workplace). One challenge of showing screen printed works to older buyers is that some people still associate "prints" with mass-produced art. Hartmann sometimes has to explain to potential buyers that each piece is unique. "The work I'm doing is a mixture of printing and painting, and each piece can take just as much time as a painting." explained Carolyn. "We print multiple layers of ink on an image and scrape wax and oil paint into it. We're taking it in different directions - pushing it in more painterly directions." Some veteran printmakers in the DC area still associate screen printing with the more toxic chemicals used in the '70s and '80s. After spending years practicing environmental law, Hartmann (like other owners of the new studios) only uses water-based inks and the most eco-friendly materials possible. Many students who come to Open Studio dc are graphic designers who spend most of their time in front a computer. Hartmann said they like getting a little messy, and bringing their hand into the printmaking. Younger clients have told Carolyn that they want to do art in a different way. They want to be very hands-on and work without machines. And they don't feel the need to be represented by a gallery. Supergraphic in Durham, North Carolina is a new art studio designed to provide workspace, equipment and instruction for the production of fine art prints and print media. Its screen printing workspace gives artists access to screens up to 30 by 40 inches, squeegees, an exposure unit, printing tables and a washout booth. The facility will also provide equipment for making relief, collagraph and monotype prints. One of the founders is Bill Fick, who teaches in the art department at Duke University. While the Supergraphic space will primarily be used to teach workshops and provide a place where people can make their own prints, eventually it will also be used for commercial screen printing. Fick notes that shared artists' workspaces have always existed in big cities, but the renewed interest in screen printing and other print arts is creating a need for co-op studios in smaller cities. In the past, artists were more interested in having screen printers reproduce their work. Now, Fick said, "Artists are more interested in doing it themselves instead of having the printing done for them." One of Fick's areas of expertise is "Vertical Screen Printing," taking screen printing directly to the walls. After doing a mural in the Duke University library, he was asked to lead a group of students in creating a 2,500-square-foot, screen printed collage that was installed on the walls of the gallery of the Visual Arts Center in Richmond, Virginia. Layered and colorful, the wall murals celebrate the 50th anniversary of the Visual Arts Center, and provide a living portrait of the people, places, key moments and artists' materials that have shaped the center's 50-year history. Each week, 50 additional images are screen printed onto the murals, including photographs and other art submitted by the public. A short video showing Fick and the volunteer artists working on the murals is posted on the Center's website. Andy MacDougall, of Squeegeeville on Vancouver Island in British Columbia, has been helping artists use screen printing to make reproductions or original prints for more than 30 years. 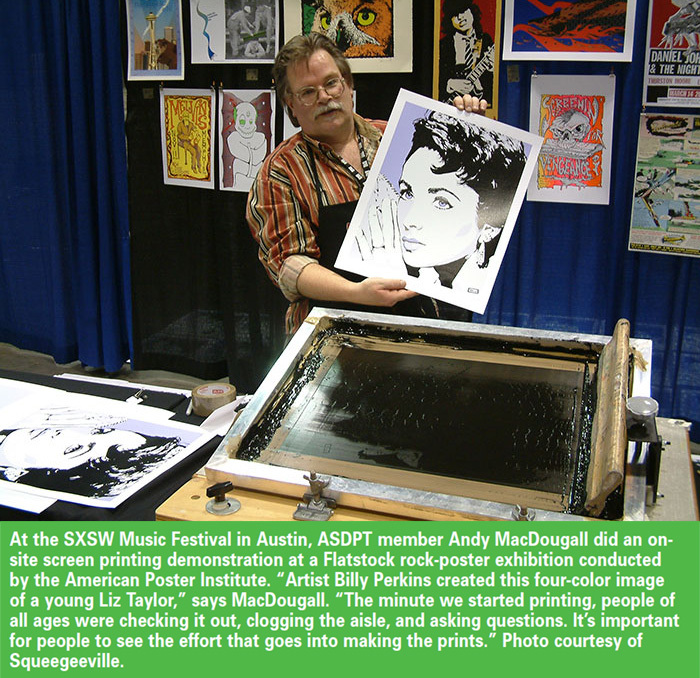 He has been an active member of the GigPosters.com forum since its inception, and has done screen printing demonstrations at the Flatstock events that resulted from the enthusiasm of that pre-Facebook online community. MacDougall agrees that there has been a groundswell of fresh interest in the art of screen printing: "It's attracting people of all ages. Pretty much anyone can do it, as long as they are willing to learn and focus." While affordable works on paper have always appealed to novice art collectors, MacDougall says today's graphic art prints provide an alternative to the fine-art prints sold in fancy galleries: "Many of the limited-edition gig posters sell for $30 and $40, and people are buying them as much for the band as for the poster." MacDougall's popular book "Screen Printing Today: The Basics" is now in its second edition. It started out as a training manual for new employees to his shop, but was redesigned as a book by his daughter Naomi. Written for people interested in poster and flatstock printing, the book presents the fundamentals of art prep and film separations, screens and stencils, inks and materials, specialized applications, and shop safety. But reading books or watching online videos can't compare to hands-on training and experience. Squeegeeville provides beginning and advanced screen printing workshops for a wide range of people, whether they work in factories, home studios or small businesses. In addition to artists, Squeegeeville students have ranged from kids to college professors and teachers to technicians. Practicing artists who can create their own films can rent the Squeegeeville studio and get personalized instruction and assistance when required. MacDougall recently read Lengwiler's new book on "The History of Screen Printing." He noticed that some of the hinged presses used in the 1920s look very similar to the set-ups that today's young designers and artists are using. The only difference, said MacDougall, is that "the screen printers in the photos from the 1920s were all wearing shirts and ties." As digital printing has became more perfect, polished and repeatable, it can sometimes seem cold and sterile. From the art buyer's perspective, if every hand-pulled print isn't identical, that's part of the charm. "There's a human intelligence in the way the inks are mixed, and there's a human touch to the press of the squeegee," said Kent. "People don't necessarily want every print to be perfect and identical. Sometimes the happy accidents look quite nice." Hartmann says the artists in her studio regard the squeegee like a paintbrush: "With each pull of the squeegee, a unique image is created." "It's hard to make an emotional connection to something that's digitally printed," said Ben Nunery. He doesn't mind explaining the limitations of hand-pulled prints to Powerhouse clients: "Because inks are hand mixed, it's not always possible to match every brand color spot on." If people want perfectly consistent prints, they can go to offset or digital. With manual screen printing, "You're going to see that human touch and some variation from print to print," said Pat Jones. "That's what people seem to like." MacDougall agrees that digital printing and screen printing will co-exist. He believes the growing interest in hand-pulled prints isn't really a backlash against digital. It simply fulfills a basic human desire to make things with our hands. Eileen Fritsch is a Cincinnati-based freelance writer who writes about printing, art, photography, design, technology and entrepreneurs. eileen@eileenfritsch.com. This article appeared in the SGIA Journal, Winter 2014 Issue and is reprinted with permission. Copyright 2014 Specialty Graphic Imaging Association (www.sgia.org). All Rights Reserved.